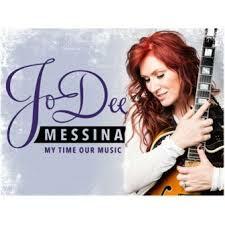 The Beatles once sang, “I get by with a little help from my friends.” Jo Dee Messina sought just that for her new album. After an amicable split from Curb, Messina took to Kickstarter to raise funds for “My Time, Our Music.” Over 1,000 backers pledged funds at various levels ranging from $5 to over $10,000. Each tier brought rewards ranging from autographed merchandise to playing onstage at a show or having Messina come to their home to cook dinner. The project was over funded by $21K from the original goal of $100,000. The overage will go to cover expenses. Fans are involved in every step of the process, from choosing album artwork to songs that will make the cut via social media. An enthusiastic Messina discussed the project from Nashville. It will come out of my pocket. We’ll make a record but people won’t get all the fun of playing onstage with us or any of the perks we’re offering. There was a huge misconception when we first started this. It’s not like I’m going to sit back, you shower me with money and I’m going to buy a Mercedes. Every tier of the Kickstarter page shows that there is a lot that goes into making a record. If we go over $100,000, everything is going right back into the album;. I’m in the process of getting a budget from one of my old records to post on Kickstarter so people can see just how much money we are saving making it this way. They can see, “Hey, I’m giving 15 bucks, what’s paying for? Sometimes, you’ll get some smarty pants saying, “Yeah, I could make that record in my garage.” Well, you can’t make this record in your garage. The money is going to mixing, mastering, tracking, overdubbing, background vocals and cartage. Of course the engineer to run the big board. Someone made a crack that they spend all that money on catering. I laughed because we get lunch from Jimmy John’s. I realize to someone outside the industry, the number seems huge but if you look at it in comparison to what a traditional record costs to make, it’s a big savings.